Born at Belen, NM, October 19, 1983. Died at Los Angeles December 3, 1973. Arthur C Goebel was often erroneously credited as a fighter pilot in WW1, but served in the Allied ground forces in France, where he became inspired by the planes circling above. After the war, he learned to fly and barnstormed to eke out a living, then went to South America in 1920 to try his hand as soldier of fortune but found no takers there, so ended up a flight instructor in Lima, Peru. Returning to the USA in 1921, he finally found his calling in Los Angeles as a member of the original legendary "13 Black Cats" aerial performers that made a good living as stunt flyers for motion pictures. As well, he also became a record-setting pilot in some memorable adventures. In a year filled with aviation records, Geobel won initial fame in winning the 1927 Oakland-Honolulu Dole Air Race. On Aug 16, he and his navigator, USN Lt William V Davis Jr, began the then perilous 2,437-mile journey over the Pacific Ocean in just over 26 hours in his Phillips Petroleum-sponsored Travel Air Woolaroc as first of only two planes to complete the trip. In early 1928 he set out on a goodwill tour of Japan with Ernest Robertson of the Fairchild Aviation Co, barnstorming around that nation, giving rides, performing, and selling the Japanese on the idea of flying. Back into racing, Goebel placed first in the first transcontinental non-stop Air Derby from New York to Los Angeles, on Sept 13, 1928, with navigator Harry Tucker in Lockheed Vega 5 Yankee Doodle. He was also a major competitor at the Natl Air Races into the early '30s, and was the only American in the 1928 Mexico City-Kansas City Air Race, which he also won. He owed his title of "Colonel" to George L Miller, a well-known Oklahoma oilman and rancher. On tour with Woolaroc after the Dole Race, Goebel landed at Ponca City and met Miller, took him on several flights about the state. "If Lindbergh has a military title," an impressed Miller remarked, "Why should not he have one, too?" Miller and Oklahoma City news publisher Walter Harrison suggested to the Governor he make Goebel a colonel on his military staffthe idea was accepted, and Goebel was so designated. 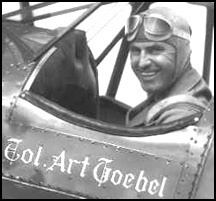 During the 1930s, in addition to operating his own flight school, Goebel joined the Army Air Corps Reserves, then served in the AAF (reportedly as pilot, which is doubtful given his age at the time) during WW2 in the Pacific. His autobiography was published in 1929, and updated by G W Hyatt in 2007. Born at Cleveland OH, November 2, 1882. Died February 2, 1942. In 1900 Louis William Greve, prolific inventor, aviation pioneer, industrialist, and civic leader, began as an office boy in his father's company, Cleveland Pneumatic Tool, and learned the pneumatic device field from bottom to top, succeeding his father as president. He submitted the first of his 46 patents in 1903. His first patent was awarded in 1904 for an impact tool design now widely known as the jack hammer. Other personal patents included shock absorbers for early automobiles (air springs) and for aircraft, one of which was manufactured as the Aerol Strut, the first oleo-pneumatic shock absorbing strut for aircraft. In 1927, Greve sat on a plank attached to the bracing struts of a taxiing plane to take motion pictures of the action of the first experimental set of Aerol Struts, which made take-offs and landings by military airplanes smoother and safer on the limited, unsteady deck space of carrier and became standardized for all sectors of aviation. In 1929, Greve was named president of the National Air Races and vice president of the Cleveland National Air Race & Show Corporation, two non-profit organizations set up to conduct the business details of the field events and exposition. He had played a major role in securing the two consecutive five-year contracts for the races through the National Aeronautics Association, and would hold the title of president of both Cleveland National Air Race organizations from 1930 through 1939. Other aviation titles included president of the Cleveland Chapter of the National Aeronautics Association and chairman and president of the Cleveland Chamber of Commerce Committee on Aviation. A firm believer that increased participation by women in aeronautics was vital to aviation's progress and public acceptance, he established the Cleveland Pneumatic Tool's Aerol Trophy Race for women pilots in 1929, from Santa Monica to Cleveland. In 1930 the derby began at Long Beach and ended at Chicago. Today it is popularly known as the Women's Air Derby, and the victor is still awarded the Aerol Trophy. At the 1931 races it was established as a perpetual classic free-for-all closed-course race for women. In 1934, he also sponsored the $25,000 Louis W Greve Trophy Race, a high-speed closed-course event open to both men and women. In it planes were required to have a 550 cubic-inch or less engine displacement, a restriction implemented to encourage greater speed and efficiency in the lower-power airplane groups. Born at Huntington NY, January 4, 1895. Died October 4, 1982. Leroy Randle Grumman founded Grumman Corporation in December 1929 with William T Schwendler and Leon A Swirbul as a repair shop for Loening amphibians. During his lengthy career, Grumman was awarded both Presidential Medal of Merit and the Guggenheim Medal in 1948, became the first recipient of the National Academny of Science's Hunsacker Medal in 1968 for his contributions to aeronautical engineering, and was enshrined in the Aviation Hall of fame. An honorary Doctorate of Engineering came from Polytechnic Institute of Brooklyn in 1949, and a Doctorate of Laws from Adelphi University in 1961. Grumman retired from presidency of the corparation in 1966, remaining as a director until 1972, at which time he retired in full, but was elected as honorary lifetime chairman of the board. He died in 1982 after a long illness. Enshrined in National Aviation Hall of Fame 1972. SEE ALSO The Grumman Story. Daniel: born at Philadelphia PA, 1856. Died September 28, 1930. Harry: born 1891. Died January 22, 1971. A father-son team who, with their philantrophies and personal involvement, affected the course of aviation history to an immeasureable extent. Although the elder, Daniel Guggenheim, died without ever having flown, even as a passenger, his legacy remains active today. Between 1925 and 1930, he put more than $3.3 million (in 1930s dollars!) into a series of aviation-related initiatives which led to the development of more reliable aircraft engines and instruments, and, perhaps most important, public acceptance of aviation as a safe and fast method of transportation. But Guggenheim was in his 70s in these experimental years, and was happy to leave the actual flying to younger people. Harry Guggenheim, on the other hand, saw service in The Great War as a naval aviator in Europe, and became a staunch advocate of commercial air travel. He conviced his father, wealthy from the family's mining and smelting business, into donating $500,000 to establish a school of aeronautical engineering at New York University, the first of eight such schools they would ultimately endow. Besides his annual Guggenheim Medal awards for great achievement in aviation, the elder Guggenheim also set up a fund to promote aviation, including research. One of its more important projects was a town-marking campaign that encouraged communities to paint their names on the roofs of large buildings so that pilots who became lost would be able to establish a landmark. A simple idea, suggested to them by Charles Lindbergh, that had a profound impact on aviation safety, saw 8,000 towns so identified by 1930. Most novel for the time, and producing long-term effects, Daniel in 1927 announced his Safe Aircraft Competition that led to the development of airplanes that could fly at low speeds without stalling, the main cause of crashes then. Two years after that, he established a flight laboratory at Mitchel Field NY to develop instruments that would enable pilots to fly even when it was too foggy for them to see the ground. Together the Guggenheims established a prototype airline between San Francisco and Los Angeles to show that air travel was safe, fast, and reliable. Although this idea had been tried in 1922 for military needs, it never caught on with the general public, and air travel as such required passengers to share space with mails and cargo. The Guggenheim made money available for aircraft and equipment, and to establish a weather service and radio communications network. Only two operators saw any future in this new ideaVarney Air Lines and Western Air Expressand using new Fokker tri-motors, WAE inaugurated scheduled service in May 1928, offering passengers a three-hour flight over a 13-hour train trip. Rather than the experiment ending, it became the matrix of operations for WAE, as well as others to follow. Additionally, the Aviation Weather Service and in-flight communications were born with this plan. Grants and research centers were established in other collegestypical was the Harvard-Guggenheim Center for Aviation Health and Safetyand the pair even sponsored Lindbergh on a 48-state tour to promote aviation. After his father's death, Harry, who co-founded Newsday with his wife in 1940, continued aviation-related philanthropies with sponsorship of rocketry pioneer, Robert Goddard.